Different Types of Ice Makers: There are many numbers of ice makers and machines available to choose. All of them don’t have the same functionality so for us, it is important to understand the difference between each icemaker type. In most of the bars, supermarkets, hospitals, restaurants, and stores the commercial units are used. Whereas for the people who love to have some specific kind of ice, it is perfect to use some special built-in and under counter ice-maker type. This below article will guide you which ice maker type is best and how one can get the benefit of the ice maker. There are different Types of Ice makers are available today in the market. According to your requirement select any type of Ice maker which are described briefly in the below article. Portable ice maker generally does not require any permanent water line and it only needs water to be poured manually into them for operating. The best use of a portable ice maker is that you can move it easily from one place to another place as they are small in size. It can be used while camps, picnics, boating or any other outer trips. As this Portable icemaker does not require any water line, it can be carried easily with you. As it is in small size it even does not require much space for storing in a house or vehicle if you are traveling to any other place. It is designed to work fast so that there is no need to wait longer for the ice cubes. Portable ice maker makes the ice very quickly when you needed, but it does not freeze for a long time. After a certain or longer period of time, the ice starts melting into water and this water is collected back to the reservoir or container where the device will start the process again from the beginning that is refreezing. This process continues till the ice cubes are collected or completely the water is drained out from the machine. It is very important to understand the ice maker which suits our business needs. Therefore the given Commercial ice maker help you to decide in an easy way. 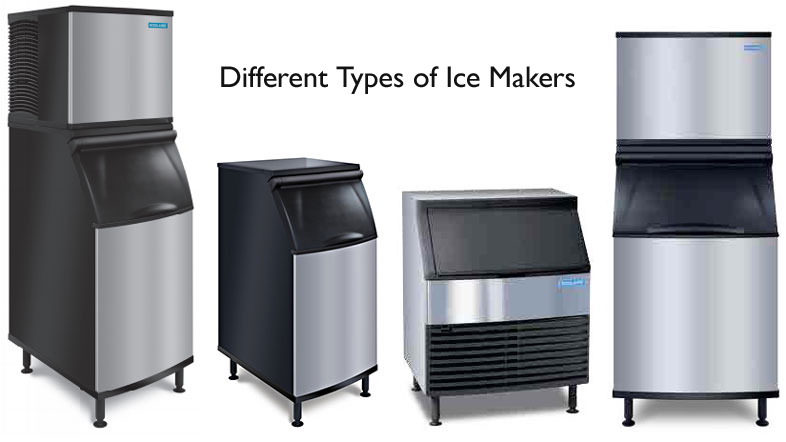 There are different types of ice makers for commercial use. They are modular ice maker, under counter ice maker, countertop ice maker. Modular Ice Maker is also known as Ice Machine Head. It has to be used along with a separate unit, which can dispense and stores the produced large amount of ice. Ice machine heads are normally available in 48 inches, 30 inches, 22 inches widths. These ice makers are designed to sit on the top and also it supplies ice to an ice maker machine dispenser or soda dispenser or ice machine bin. The output of modular ice maker ranges from 259 lbs to 2000 lbs per day. The primary benefit of Ice Maker machine head is that it gives you the complete freedom to choose. You can get the ice of different sizes and shapes. The benefit of modular ice maker is it occupies very less space as all the parts are assembled inside. This Ice Maker is preferred by so many people for small kitchens. This Modular Ice Maker comes up of 2 components. They are Dispenser and Ice Maker. It is responsible for preparing Ice of different types such as Ice flakes, ice nuggets, and Ice cube. The Ice can be scoped and stored in the dispenser, which satisfies all the needs of the company. This Dispenser can be raised to a desired and reachable height. Often Ice Maker needs maintenance but modular ice maker provides long term solutions. 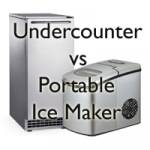 Under Counter Ice Maker is generally a small Ice maker. These Ice makers combine storage bin and Ice machine. Under Counter Ice Maker is also known as the self-contained ice maker. Most of the cafes, small bars or business does not need much Ice, therefore this under counter ice maker is one that needed. The output ranges up to 350 lbs per day. These are designed to fit into the kitchen without occupying any floor space. These Under Counter Ice makers can directly fit into your cabinet just like a dishwasher. Offices, churches, and families who are likely to need ice can get benefit with this built-in Ice Maker. People can easily integrate them into their kitchen. Countertop Ice Maker or dispenser though has a small storage bin. It can still produce 400lbs of ice per day. These Counter Top Ice Makers are found in health care settings and also can dispense water. These usually produce Nugget style ice which is easy to chew. Imagine there is a party at home, everyone is enjoying at home and you realize that there are no ice cubes in your refrigerator. Then this portable ice maker solves all your problems. Even though there are more modern refrigerators available in the market they are not as convenient as this Portable ice maker. These portable ice makers are easy to transport and store. It suits the best for the kitchen use as it produces a large amount of ice in very less time. These portable ice makers 2019 are easy to maintain and also weigh up to 30 pounds. If you are looking the cost then this Portable ice maker suits your pocket. One can also get various sizes and shapes of ice cubes from this portable ice maker. There are various types of ice makers which make the work of the individual easy and comfortable. 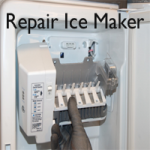 Visit Ice Maker Reviews site regularly and know the latest info. Best Ice Maker | What is Ice Maker and why we need it?